Course fees: €420.00 (Food and accommodation are not included in the price). Group reduction: Course fees for groups of 5 or more participants: €390.00 per person (Reduction A). Course fees for large groups of 20 or more participants: €370.00 per person (Reduction B). Family reduction: €390.00 per person (for 2 people), €370.00 per person (for 3 people), €280.00 per person for 4 or more people. The family reduction applies for couples, parents and children, grandparents and grandchildren. Conditions: Both courses must be registered before the first course commences, otherwise Reduction B applies (i.e. €720.00). Only one form of reduction applies per person. A combination of reductions is not possible (e.g. people who are eligible for the family reduction or the special price for both courses cannot be included as part of a group for the group reduction). The reductions can be applied in any combination for the different courses and/or different instruments. e.g. Course 1: 4 participants, course 2: 2 participants = Group reduction A (€390.00 per person). e.g. Course 1: 12 participants, course 2: 10 participants = Group reduction B (€370.00 per person). Conditions: All participants must be registered together with a list of participants (including the category of the group) before the deadline. In addition the entire sum due must be paid before course 1 commences. 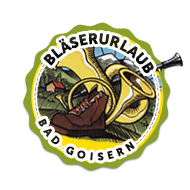 The organizers accept no liability for damages of any kind arising during the Bläserurlaub. Parents and/or guardians are responsible for under-age participants. We do not provide any supervision for under-age participants!